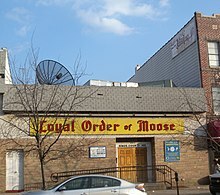 The Loyal Order of Moose is a fraternal and service organization founded in 1888 and headquartered in Mooseheart, Illinois. It has about 1 million men as members, in roughly 2,400 Lodges, in all 50 U.S. states and four Canadian provinces and Bermuda. It has an associated female organization, Women of the Moose, with more than 400,000 members in roughly 1,600 Chapters in the same areas. There is also a Loyal Order of Moose in Britain. These organizations together make up the Moose International. Moose International supports the operation of Mooseheart Child City & School, a 1,023-acre (4.14 km2) community for children and teens in need, located 40 miles (64 km) west of Chicago; and Moosehaven, a 63-acre (250,000 m2) retirement community for its members near Jacksonville, Florida. Additionally, the Moose organization conducts numerous sports and recreational programs, in local Lodge/Chapter facilities called either Moose Family Centers or Activity Centers, in the majority of 44 State and Provincial Associations, and on a fraternity-wide basis. The Loyal Order of Moose was founded in Louisville, Kentucky, in the spring of 1888 by Dr. John Henry Wilson. Originally intended purely as a men's social club, lodges were soon founded in Cincinnati, Ohio, St. Louis, Missouri and Crawfordsville and Frankfort, Indiana. The early order was not prosperous. Dr. Wilson himself was dissatisfied and left the order of the Moose before the turn of the century. [third-party source needed] When Albert C. Stevens was compiling his Cyclopedia of Fraternities in the late 1890s, he was unable to ascertain whether it was still in existence. The National Moose Lodge bylaws restricted membership to male Caucasians. In 1972, a member invited K. Leroy Irvis to visit a lodge in Pennsylvania as a guest. The lodge dining room refused to serve Irvis on account of his race. Irvis sued the Pennsylvania Liquor Control Board in federal court, arguing that the issuance of a liquor license to an organization with racially discriminatory policies constituted an illegal state action. 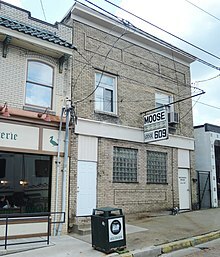 The case was ultimately appealed to the United States Supreme Court, which ruled that since the Moose Lodge was a private organization, it had a right to practice racial discrimination. At the 1911 convention in Detroit, Davis, the "Director General" of the Order, recommended that the LOOM acquire property for an "Institute", "School" or "College" that would be a home, schooling, and vocational training for the orphans of LOOM members. [third-party source needed] For months offers came in and a number of meetings were held regarding the project. It was eventually agreed that the center should be located somewhere near the center of population, adjacent to both rail and river transportation and within a day's travel to a major city. On December 14, 1912 the leaders of the organization decided to purchase the 750-acre Brookline Farm. Brookline was a dairy farm near Batavia, Illinois. It was close to the Fox River, two railway lines and the (then dirt) Lincoln Highway. The leadership also wished to buy additional real estate to the west and north owned by two other families, for a total of 1,023 acres. Negotiations for the purchases were held in January and February 1913, and legal possession of the property was taken on March 1. The name "Mooseheart" had been adopted for the school at the suggestion of Ohio Congressmen and Supreme Council member John Lentz by a unanimous joint meeting of the Supreme Council and Institute Trustees on Feb. 1. Mooseheart was dedicated on July 27, 1913. Vice President Thomas R. Marshall gave a speech for the occasion. While Mooseheart began as a school, it soon grew to become a small incorporated village and hub of the organization, housing the headquarters of the LOOM, as well as the Women of the Moose. The population of Mooseheart would grow to 1,000 by 1920, reach a peak of 1,300 during the Great Depression and go down to approximately 500, the campus' current maximum capacity, in 1979. The entire membership is sometimes referred to as the "Moose Domain". Until at least the 1970s, membership was restricted to white men of "sound mind and body, in good standing in the community, engaged in lawful business who are able to speak and write the English language". 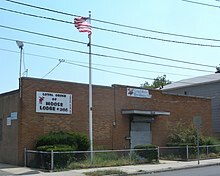 In June 1972 the Supreme Court handed down a decision partially in the Order's favor, saying that a Moose Lodge in Harrisburg, Pennsylvania need not have its state liquor license revoked because they refused to serve a black guest, but that the state could subsequently condition its license on nondiscriminatory practices. In the early 1920s the LOOM reportedly had over half a million members with 32,570 in the Mooseheart Legion and 5,178 in the Junior Order of Moose. In 1928 this had grown to 650,000 members with 59,000 in the ladies' auxiliary. There were slightly more than a million in 1966. In 1979 the LOOM had 1,323,240 members. In 2013 there were 800,000. James Davis drew up the initiation ritual for the order. It is relatively short, usually taking 45 minutes. The governor of the lodge asks the Sergeant-at-Arms to administer the Moose obligation. After candidates are asked if they believe in a Supreme Being, and if they are willing to assume the obligation they take the oath with their left hand on their heart and their right hand raised. Among other things, this obligation pledges the candidate not to "communicate or disclose or give any information — concerning anything — I may hereafter hear, see or experience in this lodge or in any other Lodge". At this point the lodge performs the 9'O'Clock Ceremony, and then the lodge chaplain or prelate explains the ten "thou shalts". Next the governor grasps the hands of the candidates while the members sing Blest Be the Tie that Binds. Finally, the governor administers the second part of the obligation, the candidates promise to support Mooseheart, Moosehaven, help fellow Moose, settle disputes within the order and not to join any unauthorized Moose organizations. The prelate offers another prayer at the altar, and all then join in singing Friendship We Now Extend. There are also death and graveside services, granted on request of the family of deceased Moose, as well as a Memorial Day ceremony every first Sunday in May. The lodge altar is draped in black and white cloth, a Bible, a flower and drapes are placed on the lodge charter and the lodge prelate leads the members in prayers and the singing of Nearer, My God, to Thee. The Moose rituals took a tragic turn on July 24, 1913, when two candidates for membership, Donald A. Kenny and Christopher Gustin, died during an incident at their initiation ceremony in Birmingham, Alabama. Kenny was the president of the local Chauffeurs Union and Gustin was an iron moulder. Both men were made to look upon a red hot emblem of the Order, then blindfolded, disrobed and had a chilled rubber version of the emblem applied to their chests, while a magneto was attached to their legs and an electric current was applied to them by a wire to their shoulders. The aim was evidently to make them believe that they were being branded. Both men fainted, but, as it was thought that they were feigning, the lodge officers did not stop the initiation until it was evident that the two were dying[clarification needed] and the lodge physician was unable to revive them. The LOOM has historically supported numerous charitable and civic activities. It has sponsored medical research for muscular dystrophy, cerebral palsy, cancer and cardiology, as well as the March of Dimes. It has also supported Boy Scout and Girl Scout programs. In 1925 the LOOM brought a suit against the Independent, Benevolent and Protective Order of Moose, an African American order. They attempted to obtain a legal injunction to keep them from using the Moose name, ritual, emblem and titles of its officers. The New York Court of Appeals restrained the African American order from using the name "Moose", but allowed them to continue using the same fraternal titles and colors. The IBPOOM was an unrelated all-African woman order. By 1966 the Lutheran Church–Missouri Synod and the Wisconsin Synod forbade membership in the Loyal Order of Moose. The Catholic Church, however, has never explicitly objected to the Moose, despite having condemned similar organizations, such as the Freemasons for their oaths and other rituals. ^ "The Law: Other Decisions". Time. 26 June 1972. ^ Beeferman, Larry W. (1996). Images of the Citizen and the State: Resolving the Paradox of Public and Private Power in Constitutional Law. University Press of America. p. 132. ISBN 9780761802327. ^ KARPATKIN, MARVIN (June 18, 1972). "Support for the right to exclude". The New York Times. p. 6. ^ Wellner, Tina L (1975). "Going Public with Discriminating Private Clubs". Fordham Urban Law Journal. 3 (2): 289–309. ^ Eastman, Frank Marshall (1922). Courts and Lawyers of Pennsylvania: A History, 1693-1923, Volume 4. New York: The American Historical Society, Inc. p. 358. Retrieved 29 July 2018. Wikimedia Commons has media related to Moose International.